On July 15th I made lots of Thank You cards! Some for The Children's teachers and some for our Sunday Club leaders. And I made a summer berry 'Eton mess' with strawberries, raspberries, blueberries, cherries, meringue and whipped cream - yum! Eton Mess is popular here too but we don't have it very often. I loved the idea for the wordle card so much, I scrap-lifted it to make a birthday card for a friend of ours. I struggle for ideas for masculine cards and it was just perfect so thanks for the idea! mmmh eton mess is well scrummy, now where can i get some cream from? 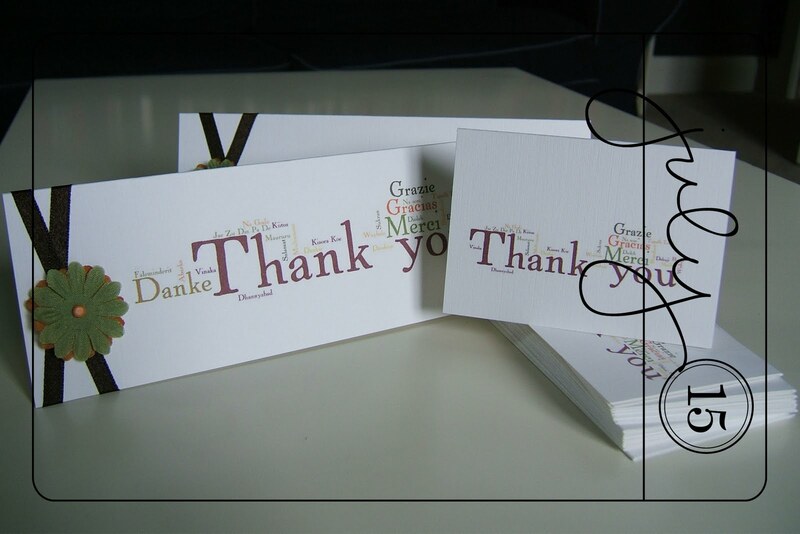 Great thank you cards. I used wordle for my son's bday card last year and listed all the players from Chelsea on it then added his name into the mix... went down very well!